Does this cover look familiar? I'm sure it does. But even if you were scratching your head at first thinking you've seen this somewhere before, I'm sure the title locked it in for you. The latest from the prolific Automatic Music is an ambitious 3-CD set that is a tribute to Pink Floyd, experimentation and the early 1970's in general. The first thing that struck me even before I heard a note of the music was that all the participants are pictured and named, which is unusual for this ensemble that functions more as a fluid collective than a band with a set lineup. The musicians that grace this set are Kevin Killinger on guitar, Gentlemaniac on guitar, Bret Hart on guitar, Tragic Bunny on guitar, East October on keyboards, and Gurney Brown on drums. That's right folks... four guitars... all improv... and boy, do these guys trip out. Disc 1 is considered to be the new Automatic Music album. The liner notes point out that CD selections are usually taken from live performances and/or studio sessions, though in this case the album is made up of recordings all made in the same day. There are 7 tracks, 2 of which are in the 13 minutes range and one of which is an epic 18 minute workout. Much of what we hear is the very essence of raw jamming psychedelic cosmic Krautrock. A bit of Neu! here, a dash of Amon Düül II there, a fair dose of Faust, plenty of free-wheeling stretched out acid excursions, and scattered bits of the free-improv experimentalism that we've come to expect from Automatic Music. If anything sounds at all like Pink Floyd it's the most cosmic freeform voyages we heard from that bands earliest era. But there is also that rawness and strained dissonance that characterizes much of the Automatics' music, though I chock that up to the Krautrocky edge sneaking in and doing it's magic to the psychedelic spaciness of the Floyd elements. Other appropriate references would include the thudding space rock vibe that recalls early Guru Guru and Space Ritual era Hawkwind, and the general feel is of a rolling lysergic jam fest that mashes together every tripped out influence you can imagine, including some of the band's more experimental free-improv tendencies, and perhaps some of the Residents more freaked out rocking moments with Snakefinger on guitar (think "Satisfaction"). 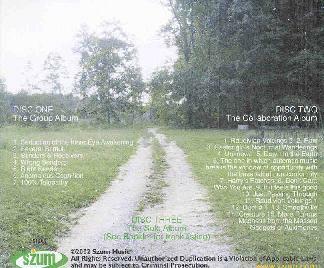 Disc 2 consists of various other projects the highly active Automatic Music members are involved in, as well as some live Automatic Music tracks featuring various lineups of the band. 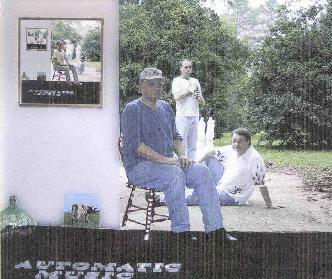 This disc also features some of the more experimental and sometimes abstract music they have created. There are also several live Automatic Music tracks which are definitely in the more experimental realm, though there always seems to be a prominent Kosmiche element to the music. We've got searing noise waves, jamming chaos guitars, throbbing noise drones, feedback, and all manner of sound collages and constructions. Standout track include "Harry's Partches", a free-improv jazz piece that I would have liked to have heard developed beyond it's 3 minutes, and "Creature Continuum" which is like a meeting of the early Residents and the Art Bears. Also included are free-improv guitar duets by Bret Hart and Gentlemaniac, Gentlemaniac and Tragic Bunny, Bret Hart and Scotty Irving, and a completely spaced out Gentlemaniac/East October collaboration called "More Furious Madness From The Mass Gadgets Of Auximenes" that is named after an early Pink Floyd live show. Like early Pink Floyd meets Neu! There are also tracks from Entertainment Unit and Zil, a couple of Automatic Music offshoot bands. Entertainment Unit is a quartet of Gentlemaniac, Phred Rainey, Gurney Brown, and Tragic Bunny. "Down In The Earth (Where It's So Dark)" was my favorite, being a trippy rocking Blues-psych tune. "If It Feels Good (It's Gotta Stop)" is a bouncy, somewhat quirky rocker. And "Smoothville" is similar but with a spacier edge. Zil is yet another quartet, this time with Gentlemaniac, Tragic Bunny, Terry Lonergan, and Gwen Young. "Don't Care Who You Are" is a deliciously raw old time Bluesy acid rock song with Gwen Young's punky Grace Slick vocals. And "Just Passing Through" is a lulling sort of avant-psych tune. Village Pistols is a duo project from Gentlemaniac and East October. They chime in with two tracks, one entitled "Syd Barrett", which is a raw lo-fi garage rendition of the old Floyd psych-singles era, and the other is "This Guy's In Love", which... I think... was a Bobby Sherman song??? Tragic Bunny gets three tracks... a trippy lo-fi song, a raw garagey trip rocker, and "Losing Touch With My Mind" which is a killer Spacemen 3 cover. Keyboard player East October has some very interesting tunes. "Kaddish" has a traditional ethnic sound (of some kind). And speaking of traditional ethnic, he does the genuine national anthem of Mongolia. I really dig his valium overdosed version of John Lennon's "Instant Karma". And "Axum" is a huge glom of samples with circus-like hip-hoppy grooves, African chants, and what must be Beefheart Blues guitar. Bret Hart contributes a track from his singin/songwritin band Hipbone. This tune took me a little by surprise being much more metallic than any of the Hipbone I'd heard previously. "I Like Toast" features classic down home Blues done Hart style. "Hornet, Bee And Wasp" is a very cool Zappa tribute. And a duet with Bret and Scotty Irving lays down some freaky soundscapes and insect head on crashes. Gentlemaniac does a few songs with a country kick, with "You Don't Know What It's Like" having vocals that are a dead ringer for George Harrison. "nY" is a balls out rockin take on Neil Young's searing electric guitar. And the perfect finale to this mammoth set can only be a cover of a track from the album it pays tribute to. Gentlemaniac's cover of "Grantchester Meadows" is spot on with the vocals but the music is way cooler than the original. In summary, if you're already an Automatic Music fan then this set is a must. But if you've yet to dip your toe in the water then this is probably the best place to start. These musicians have their hands in a banquet of projects covering a variety of musical styles. And at only $15 for the 3 disc set you can't go wrong. You get a collection of some of the best spaced out Automatic Music jams, as well as unreleased live tracks and a whole slew of examples of the artists' individual projects. The nice price also makes it easy for fans of cosmic music who may not have sampled much of the more experimental stuff to check it out at no risk. If you end up not caring for it... you've still got the space jams. So take the plunge. And stay tuned next issue for a full Automatic Music profile! For more information you can visit the Szum Music web site at http://www.szum.com.